I finally got a chance to see the supernova in Messier 82 last night. What with clouds, snow, or -10F temperatures with -30F wind chills either blocking the view or keeping me inside to not freeze to death when it was clear, last night offered me an opportunity. It was clear - I'd put it at around a 7 of 10 for transparency - and though still cold and windy, 19F with a 10-12 mph breeze felt downright balmy. I also didn't have much time. I am in the process of directing the play "Doubt: A Parable" for one of my local theater troupes, and we had a rehearsal - well, set building - last night. I got home around 10. Had hardly seen my wife or kids that day, so I spent a few minutes catching up with them. After that, I decided to try to spot SN 2014J. I didn't want to take much time to set up a large scope, but knew I needed useful aperture. I chose to use my Starblast 4.5 scope on my Super Simple 2x4 tripod - two hands, out-the-door, ready to go. Eyes on the Sky as a website exists entirely as a means to raise awareness about light pollution and work towards reducing it. I started writing articles for my local newspaper to educate about the night sky and include a paragraph or two about light pollution, and then in 2011, moved to a worldwide audience with YouTube videos that are views in literally dozens of countries around the world. Marking 500,000 views in late October of 2013, I have been pleasantly surprised to have exceeded 600,000 views already in early 2014. While this is personally satisfying on some level to have that kind of viewership, I often wonder about the real-world effects. Am I really making a difference? The Light Pollution forum at Cloudy Nights is a good resource, but not heavily trafficked compared to, say, arguments over the best eyepieces or whether reflectors are better than refrators. Sadly, many amateurs assume that the International Dark Sky Association will do this for them; they pay their annual dues, and hope for the best. What they don't realize is the IDA has a staff of just SIX PEOPLE. 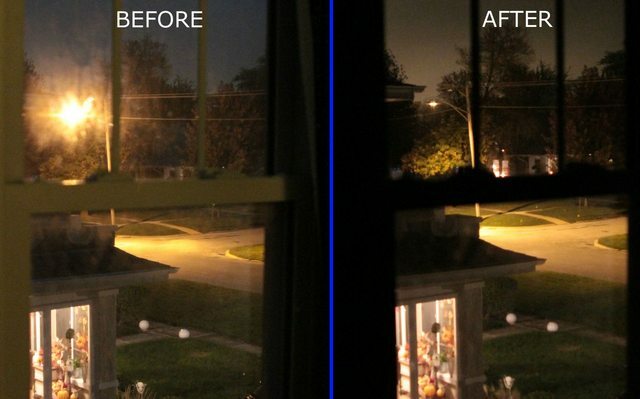 Six people aren't going to get light pollution changed in every locality. We ALL need to get involved. And you don't even need to spend time to do it on clear nights - just do it when it's cloudy or raining. On Friday Jan 31 of this week (see above graphic), a very slim crescent from a just-past-New-Moon will pair up with Mercury in the evening sky. Ideal times to look are about 45 minutes to an hour after sunset. The planet is surprisingly bright, though you will need to look in what I call the "middle twilight" area of the sky. That's the area of twilight between the darker sky above it, and the brighter sky below from the already-set Sun. In that transition zone, the bright point of Mercury pops out - if you have access to a relatively flat and clear western horizon. This is truly a week for the Moon to be nearby objects. About an hour before sunrise on the morning of January 28, look out towards the east-southeastern sky where you have a clear, unobstructed view. Venus will be hard to miss, it's vivid, bright sparkling light dancing about 10 degrees above the horizon. For the next week or so, the Red Planet of Mars will be nearby the bluish white star of Spica. The two will not be much above the horizon at midnight, but an hour later achieve enough elevation to be reasonably observed. The contrast between them should make for an interesting sight, too: Mars has a very distinct, orange hue to it, and Spica is a large, B-spectral class star that glows with a bluish tint. With the two objects at nearly the same magnitude, and just a few finger width's apart from each other, they are well suited to comparison. Of course, the actual size and distance is fascinating to consider as well. Here's what's happening in the night sky for the week of January 27 thru February 2 Want to see what's up in the sky this week? This daily reminder chart will let you know lots of individual, time-sensitive events occurring in the night sky for amateur astronomers to observe naked eye, with binoculars and sometimes a telescope. Here's what's happening in the night sky for the week of January 13 thru January 19 Want to see what's up in the sky this week? This daily reminder chart will let you know lots of individual, time-sensitive events occurring in the night sky for amateur astronomers to observe naked eye, with binoculars and sometimes a telescope. Immediately adjacent to Aristarchus is Herodotus, named for the Greek historian known as the "father of history." This is a lava-flooded crater, and therefore appears more flat and darker than Aristarchus. But the sinuous valley-cleft known as Vallis Schoteri (or Schroter's Valley) appears to start about 25 kilometers north of here, winding 200 kilometers in total length. It's deepest section is 1,000 meters. It appears like a dry river bed, but requires excellent atmospheric seeing and very high magnification to see detail here well. The Moon is tidally locked with Earth, meaning it only shows one "face" to us, no matter where it is in its orbit around Earth. However, from Earth, we can see more than 50% of the Moon's surface due to libration. See graphic at right for what libration looks like over the period of a month.